Tottenham Court Road tube stop is at the corner of Tottenham Court Road, Oxford St and Charing Cross Road. Books, technology and shopping depending which road you take. This station has been in existence since 1900. 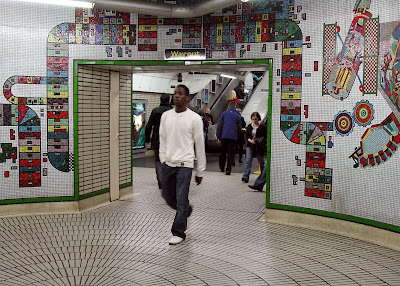 The tile work part of the 1984 renovation was the work of Eduardo Paolozzi. Love the art!!! Not too 'WAY OUT' for me.....very good photo again. Mostly, I like when the original decoration is kept (many Paris metro stations are now brought back to what they were), but this one looks really attractive to me! In Oxford Street I've spent DAYS inside His Master's Voice and Virgin Megastores! This is a lovely renovation to my eyes. I do like how very many other underground systems use art to decorate their tunnels and stations. Also, I know that London uses the expression "tube" and France uses the expression "metro" and that NY uses the expression "subway". Here in Sydney if we use anything other than train it would probably be "underground". I love the circular floor -- reminds me of the Wizard of Oz and the yellow brick road. I've dreamed of going to Charing Cross Road ever since I saw the movie/read the book 84 Charing Cross Road. Great photo! The tile work is amazing. I also like the circular pattern in the floor. Looks like an example of renovation done in good taste. Like NYC and most other major cities, subway stations are a great resource for interesting public art work. Yeah, the tiling is great. I suppose its probably not very practical, (railway authorities might not approve) but I think a tripod shot with a long exposure time would look great as the people would just be blurred 'ghosts' in the image. Hmm, I'm letting my imagination run away! Excellent photo, nevertheless. Wow, that is interesting tile work. I don't think I've ever seen it before and I thought I'd been in all the major tube stations in London at one time or another. It appears bright and clean inside for a subway. This is fantastic tile work. And, it is very cool that Paolozzi created the first mosaic! He is one of my favourite artists! Happy belated Subway Day Mo! I like the art work on this wall, reminds me of some games we used to play when I was a child. So beautiful! That is so interesting - Eduardo Paolozzi was the artist I featured on my blog a couple of months ago. He desgiend the Piscator at Euston Station too.